Sailrock Resort is great for those who want complete privacy on their vacation. 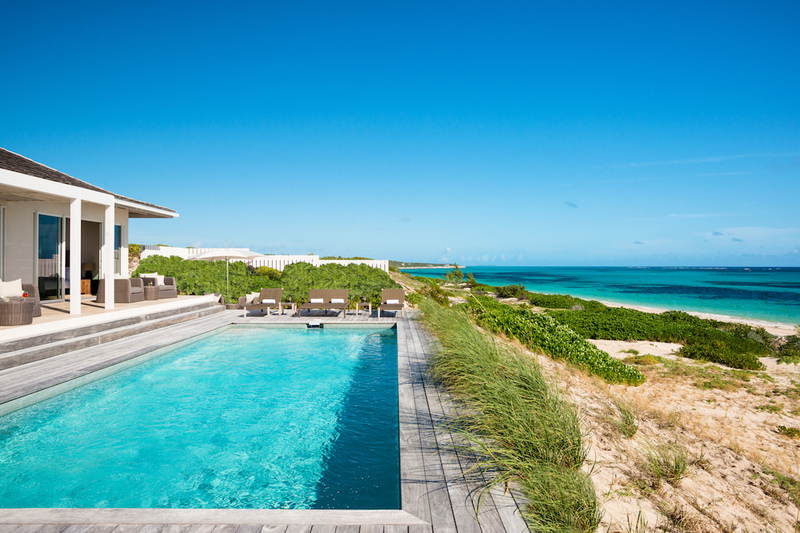 South Caicos is almost totally undeveloped, but the villas and nearby resort has turned an unpopulated beach into a place of luxury. You’ll be hard-pressed to find a meal or drink you dislike, whether its prepared by the optional private chef or enjoyed at the Great House Restaurant. To top it off, the bedrooms all have a great view of the ocean and plenty of space for two couples. Sailrock Resort Beach Front Villa sits on a 25’ stretch of uninterrupted beachfront on the secluded southern coast of Turks and Caicos. With daily housekeeping and over 2500 square feet of modern interiors, this is the perfect home for two couples. Outside, there are several places for guests to relax and unwind. The pool terrace has lounge chairs and a temperature-controlled pool with ocean views, while the adjacent garden has a reading nook. A pergola shades the outdoor living area and connects to the Great Room. There’s additional outdoor dining and seating in the courtyard, and guests have access to the resort’s fitness center. Sliding glass doors perfectly frame the ocean view, which is best enjoyed from the living room. The dining table features wood benches and the spacious kitchen island leads into the gourmet, modern kitchen. Each of the four bedrooms are equipped with king beds or two full beds, his and her closets, and ensuite baths with dual vanities, oversized walk-in showers, and soaking tubs. In between two of the bedrooms, the media room provides space to congregate at the end of the day. Sailrock Resort can dine at The Great House Restaurant or relax at the resort spa. Activities such as whale watching, conch diving, and kite boarding are also available.